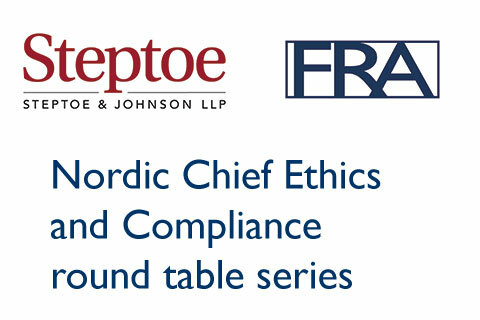 FRA launched their first three Chief Ethics and Compliance round table events in the Nordics in June on corporate behavior and ethics & compliance in partnership with Steptoe. The Nordic Chief Ethics & Compliance round tables were arranged in cooperation with Michaela Ahlberg at The Grey Zone AB, Tormod Tingstad at Kammeradvokaten / Adv. firma Poul Schmith and Anna Romberg at Cargotec. If you would like to attend future round table events please email us to be added to the invite list.